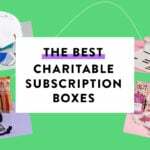 Boxwalla is a subscription box company dedicated to sharing the best food, books, films, and green beauty items. They curate bi-monthly boxes in each of those categories. Subscribe to one or more, and add or switch interests at any time! This review is of the Beauty Box. The box is crafted of tree-free paper by workers at a small company in Rajasthan, India. The process is child-labor-free and helps support artisans whose families have been making paper for generations. A+ Packaging! You will want to save and reuse these boxes! The Products: Luxurious and effective green beauty products for your skin and body. The products are crafted by artisans from all over the US. All products are full-sized or large travel-sized products and are cruelty free. Check out all our Boxwalla reviews and more great green beauty subscriptions in the Beauty Subscription Box Directory! Each Boxwalla box comes with a letter printed on high-quality cardstock detailing the items included. And there are cards for the individual items/brands included, too. It’s made with only natural, organic and 100% vegan ingredients, with white clay being the first ingredient. Normally, I don’t mind the smell of natural clay masks, but I’m not crazy about the scent either. Not the case with this product! It smells like a lemon cookie! And the formula is super gentle – I love using it as an exfoliating cleanser. I’ve sampled this product before, and it’s definitely a beauty cult classic for a reason! It’s super easy to blend, and it gives your skin a barely there shimmer/dewy highlight that catches the light while still looking natural. It’s definitely an everyday look makeup product! This eye serum is designed to “target dark circles, inflammation, discoloration, and visible signs of aging around the eyes.” It’s made with many natural and organic oils, including coffee fruit oil, which gives it a unique (and pleasing) scent! I found the oil blend to be decadent and super moisturizing. It took a few minutes to absorb into my skin, but the results were hydrated skin – and no irritation! Verdict: The December Boxwalla Green Beauty subscription box has a value of about $110.60! I think that’s a great value for the $49.95 price if you are looking for high-end natural and organic beauty and skincare products. Like Beauty Heroes, this box definitely feels like quality over quantity, and I love it! What do you think of the December Boxwalla Green Beauty box? How do subscribers rate Boxwalla Beauty? Do you subscribe to Boxwalla Beauty? Add your rating now!